Companies today have more data at their disposal than ever before and it is growing with no bounds. It’s true that only data (and its proper usage) has the potential to transform how corporations will shape up and create value for themselves and their customers in the future. By 2020, the number of users of modern BI and Analytics platforms that are differentiated by augmented data discovery capabilities will grow at twice the rate — and deliver twice the business value — of those that are not. By 2020, natural-language generation and artificial intelligence will be a standard feature of 90% of modern business intelligence platforms. By 2020, 50% of analytical queries will be generated via search, natural-language processing or voice, or will be automatically generated. By 2020, organizations that offer users access to a curated catalogue of internal and external data will derive twice as much business value from analytics investments as those that do not. Through 2020, the number of citizen data scientists will grow five times faster than the number of expert data scientists. Enterprises in India are fast catching up too. Gartner’s estimates suggest that in 2018, India’s analytics and BI software market will be US$ 304 million – a growth of 18.1% from 2017. The data management software market revenue in India is on pace to total $950 million in 2018, a 13.2 per cent increase year over year. While there’s nothing very revealing in the data stated above, but it certainly indicates towards a fact that the future will be ruled by enterprises that are driven by the intelligent insights culled from the available data. Those who will deploy cutting edge tools and technologies to harness the value of the data will be the ones who will rule their respective domains. There’s a lot said about data being the new oil and its perhaps not wrong at all. Of course, data, like oil is a source of power. Those who control data today (think of Internet giants Amazon, Alibaba, Facebook or Google) are establishing themselves as masters of the universe, just as oil barons did 100 years ago. I am not sure how the agencies arrive at these numbers but according to Gartner, 80% of the large enterprises will have a CDO (Chief Data Officer) office fully implemented by 2020. Currently, the average number of employees in the office is 38, but 66 percent of organizations surveyed expect that the allocated budget for the office will grow. However, Gartner’s predictions on the other CDO (Chief Digital Officer) weren’t so accurate so there is certainly a reason to doubt these numbers too. In any case this proves how keen organisations are in having a data strategy in place, which includes data governance, analytical modelling, and other strategies that are necessary to harness the value from data coming in from various sources. Given the demand in the market, the number of companies providing Business Intelligence and Analytics software/solutions has also gone up enormously. If we exclude geography-specific, local, and home-grown companies that provide BI tools and SaaS-based analytics platforms, there are over 50 globally recognisable organisations offering BI and Analytics suites. This includes the popular ones like Tableau, Microsoft, IBM, SAP, Salesforce, SAS, Tibco, MicroStrategy, QlikTech, and more. Below is the Gartner’s Magic Quadrant for 2018 that places these organisations into the categories – Leaders, Challengers, Niche Players and Visionaries. Without any preference or bias, there are these 10 companies that enterprise CIOs should study if they are looking to enhance their data analytics capability. Tableau: Tableau BI offers to visualize and understand data very well. Given its product and user satisfaction ratings this is surely one of the top five choices in the BI space. Tableau allows enterprises to quickly connect, visualize, and share data seamlessly on all platforms and devices. Without even having the necessary programming skills, you can create and publish dashboards and share them. It is a self-service analytics solution providing quick resolutions to your business problems. Tableau Desktop, Prep, Server, Online, Public all are solving complex business problems. Microsoft Power BI: It allows enterprises to connect to 100s of data sources, simplify data prep and drive ad-hoc analysis quickly. Power BI allows users to view dashboards on the go, get alerts when the data changes and drill into details. For a CIO, it means simplification of management, easy compliance, and security of data while allowing access to people. It uses Content Packs, which has dashboard reports, data model and embedded queries. Natural Language Q&A is one of the most powerful tools of Power BI. 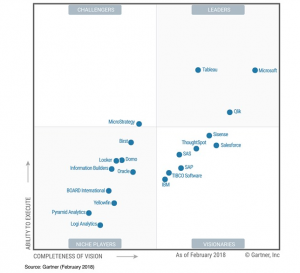 Similar to Tableau, Power BI also features in the leaders’ quadrant on Gartner’s 2018 MQ for BI. 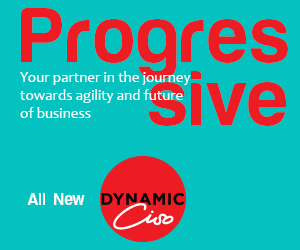 Qlik: According to Gartner, Qlik’s position in the ‘Leaders quadrant’ is driven by progress on its roadmap for augmented analytics, improvements in ease of use.” Qlik’s enterprise governance and Associative Engine for free-form analysis have continued to dominate as a differentiator. Its unique associate technology brings all data together without the complexity of data warehouses, and empowers the users to explore data at their will. Qlik offers a cloud-ready BI platform for companies of almost all sizes. Qlik Sense a fully integrated, cloud-ready platform powered by Associative Engine that indexes all data relationships with no data left behind and no need to fully clean and model data in advance. MicroStrategy: The only challenger in Gartner’s MQ for BI platforms in 2018, MicroStrategy has begun re-focusing on its customers, strengthening its support and service capabilities globally. The company wants to be more proactive with its users. Both Gartner Magic Quadrant for Analytics and Business Intelligence Platforms 2018 and Forrester Research’s Enterprise BI Platforms with Majority On-Premises Deployments, Q3 2017 place high bets on this company. The company competes well in large-scale reporting and data discovery deployments for large and complex datasets. It is strongly integrated platform for all use cases. While it’s not a unique capability, MicroStrategy recently released drivers that lets you mix and match analytics and BI solutions. On one hand, you can leverage MicroStrategy cubes and reports, while presenting in your favourite visual exploration platform. SAS: One of the largest, privately held BI software companies, SAS has been trying to keep pace with the disruption in the BI market. It has been seen making efforts to keep its platform contemporary, and open. SAS Visual Analytics on “Viya” brought a number of key improvements. It extends the SAS Platform to enable everyone – data scientists, business analysts, developers and executives alike – to collaborate and realize innovative results faster. While totally unrelated to core business environment, SAS is also part of the “Data for Good” movement, which encourages using data in meaningful ways to solve humanitarian issues around poverty, health, human rights, education and the environment. SAP: According to the company, it has been driving a BI product convergence strategy over the past several years to focus on the BI use cases organizations need to address and reduce the complexity of multiple BI solutions. The company believes that just simplifying the platform alone won’t help. There is a need for a BI platform that delivers a single BI solution in the cloud. 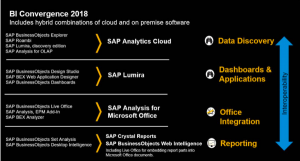 SAP Analytics Cloud brings together data access, wrangling, discovery, visualization, analysis, prediction, forecasting, planning, & what-if, all augmented by AI and Machine Learning. These capabilities provide smarter more intuitive insight and allow organizations to always stay ahead for individuals, teams, and across the enterprise. Tibco: Tibco offers one of the best visual analytics platforms for enterprises. According to Gartner, it has “extensive capabilities for analytics dashboards, interactive visualization and data preparation in a single design tool and workflow, while offering flexible processing options either in-memory or in-database.” The company continues to expand its features to include data science, machine learning and streaming analytics, location intelligence, data cataloguing, data virtualization etc. Last year Forrester names ‘Tibco Spotfire’ a leader in The Forrester Wave Enterprise BI Platforms. IBM: IBM presents its BI and Analytics challenge through IBM Cognos and IBM Watson Analytics. In the Gartner’s MQ Visionary category, IBM hopes to take lead in this segment through its Cognos Analytics by combining production reporting capabilities with self-service dashboards and ad hoc analysis all within one modern analytics and BI platform. “An improved user experience and the initial inclusion of augmented capabilities, specifically search, within Cognos Analytics makes it an easier-to-use and more visually appealing platform. It is available both on-premises or as a hosted solution on the IBM cloud. Watson Analytics also provides augmented analytic capabilities, including automated pattern detection, support for NLQ generation and embedded advanced analytics via a cloud only solution,” states the Gartner report. Salesforce: Salesforce Einstein is gaining popularity in the market. Based on the artificial intelligence technology, Einstein captures all machine learning capabilities in Salesforce portfolio with automation and deeper insights. Among other things, it has predictive analysis for forecasting data for better insights. One of the great strengths of Einstein Analytics is that you can report directly from Salesforce. While earlier for extensive reporting, it was necessary to export, transfer or send your data to an additional ETL-tool. ThoughtSpot: It is recognised in Gartner MQ 2018 as a visionary. It’s search and AI-driven analytics platform makes it easy for anyone to get insights in seconds. The company has raised close to $306 million so far to challenge incumbents with a platform that uses AI to simulate the work of data scientists. It also uses an in-memory calculation engine to run thousands of queries on billions of rows of data to ferret out insights that it says a business user would find interesting but wouldn’t know to ask about.